I’m a sucker for color in any artist’s work, any medium. I am always intrigued by artists who seem to go through phases (much like Picasso), because, as a painter, I don’t see it in my own work. Someone recently (yesterday) pointed out to me my gradual disinterest in buildings in my landscapes and the emphasis on pure landscape—devoid of buildings or human beings. I had to think at what point I did that, and could not pinpoint it. However, I would imagine it is the same for other artists. 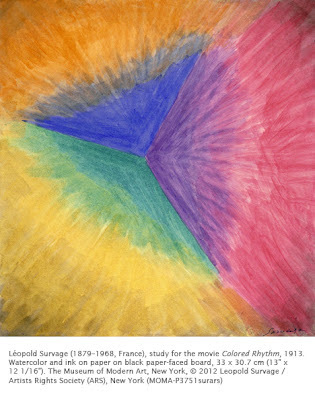 This work by Léopold Survage intrigues me because he went through an intense period of interest in Cubism, and then gradually returned to representational art. What’s interesting about his courtship with Cubism is how it summed up many of the avant-garde tendencies of the second decade of the 20th century. Survage (also known as Léopold Sturzwage, Leopold Stürzwage, Leopoldij Sturzwasgh, or Leopoldij Lvovich Sturzwage) was a Russian artist born of a Finnish father and Danish mother. Although he initially studied piano (taking a diploma in 1897), he decided to become an visual artist, studying in Moscow starting in 1906. He was associated with the circle of avant-garde artists that included Aleksandr Archipenko (1887–1964), Mikhail Larionov (1881–1964), and Natalija Goncharova (1881–1962). He moved to Paris in 1908, quickly becoming a member of the group of avant-garde artists there, associating with Amedeo Modigliani (1884–1920) in particular (who painted Survage’s portrait). Although Archipenko considered Survage a Constructivist, Survage held himself to be a Cubist. He exhibited with the Cubists in 1911 and 1912. From 1912 to 1913, Survage sought to unite his musical background with abstract cubist compositions that he called Colored Rhythm. In this he was similar to another Russian émigré Vasily Kandinsky, who also thought that painting could express musical ideas. Survage’s intention was to turn the cubist experience into film, using highly structured pictures linked by repetition of a group of symbolic elements that evoke a sensation as an analogy to music. If he had succeeded in getting the project going, he would have been the first abstract animation film artist. After 1922, having failed to produce a Colored Rhythm film, his subsequent commissions were to produce theater and ballet scenery. These works, I think, helped moved him away from Cubism. From 1925 to 1932 he lived in the southern French city of Collioure, a mecca for painters. He developed an appreciation for the life and labors of the local people, which populate his paintings of the period and after. Another French artist who turned away from an avant-garde (Fauvism) style back towards realism after moving to Collioure was André Derain (1880–1954). Activity: Decorate a grid with colors that create visual movement. Draw a grid on an 11 x 8 ½” piece of paper with pencil. Using the primary colors red, blue, and yellow, color the grid in so that the colors vibrate against each other visually and create the perception of movement or rhythm. Wow, this was a great read, thanks!